Lionfish Derby is fortunate to have the support of our wonderful community. You can do your part to help. Listed below are ways you can help. Whether volunteering, participating in a fundraising event, or making a donation... your support is greatly appreciated. 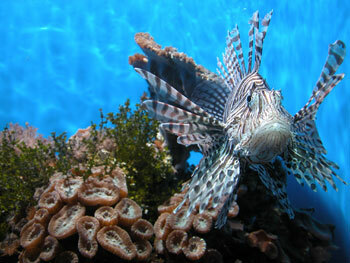 Palm Beach County's first Lionfish Derby held at Sailfish Marina in August 2011, was a big success. 706 lionfish were officially caught and counted. Many of them were deliciously prepared for the public by Singer Island Hilton Hotel's Chef Oscar on the waterfront at the Sailfish Marina. A fantastic time was had by all. We need your support for future Derbies. Coming up in 2012, in addition to Palm Beach County and Green Turtle's Derbies are: Broward County's first Lionfish Derby (dates to be announced), three Keys derbies. We appreciate your support!